HAPPY HALLOWEEN party peeps! Today’s the day that little kids wait all year for! 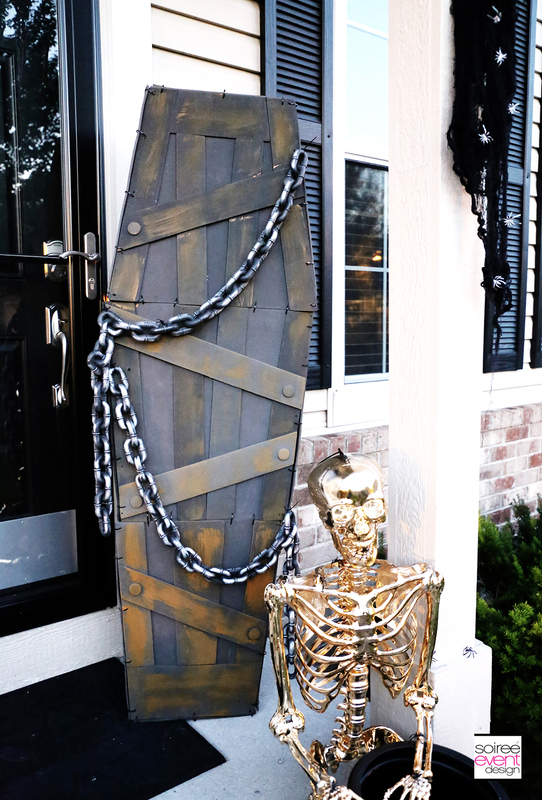 We are heading out for a fun night of trick-or-treating and can’t wait for people to check out my GOLD SKELETON HALLOWEEN PORCH IDEAS featuring lots of Halloween decor from Oriental Trading. This post was sponsored by Oriental Trading with either payment and/or product to review. All opinions are my own as I ONLY promote brands that I LOVE and actually USE. 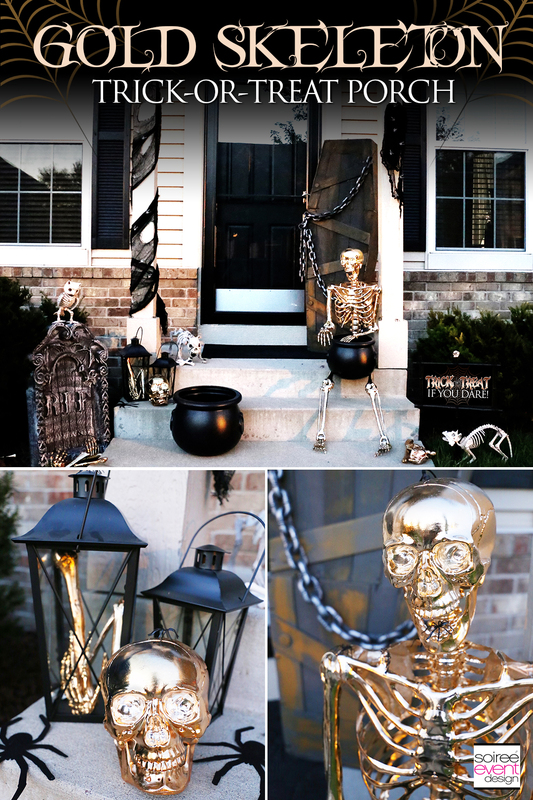 GOLD SKELETON HALLOWEEN PORCH IDEAS! Does your family all go out trick-or-treating together in your neighborhood? That usually means there’s no one at your house to give out candy to trick-or-treaters while you’re gone, right? WELL…do what I used to do and set up a Trick-or-Treat Porch! Decorate your entire porch and walkway and fill large cauldrons with candy. 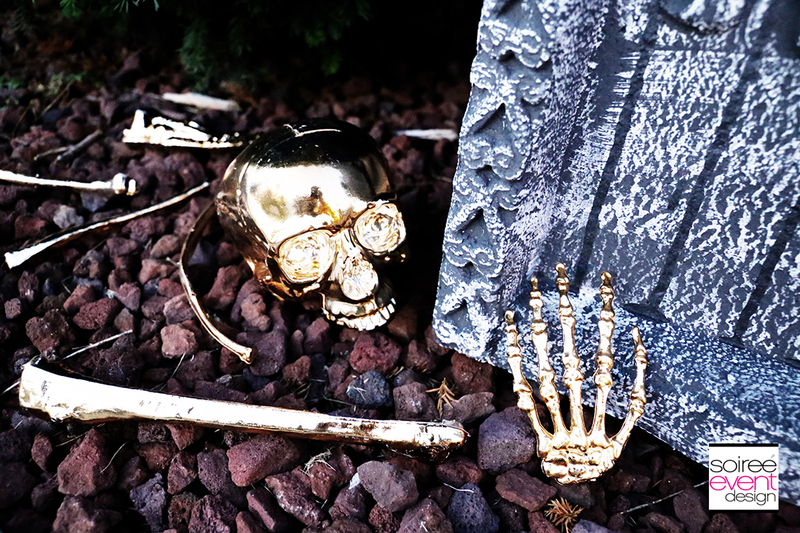 Check out my Gold & Black Halloween Front Porch over on Oriental Trading’s new site Fun365 for all the details AND a full shopping list so you can duplicate this exactly! THIS YEAR’S NEW MUST HAVE – full-size gold skeleton! I mean seriously….how fabulous is this guy! You can post him sitting or you can buy a bag of loose gold skeleton bones and use them scattered around. Either way…SPOOKY FAB! 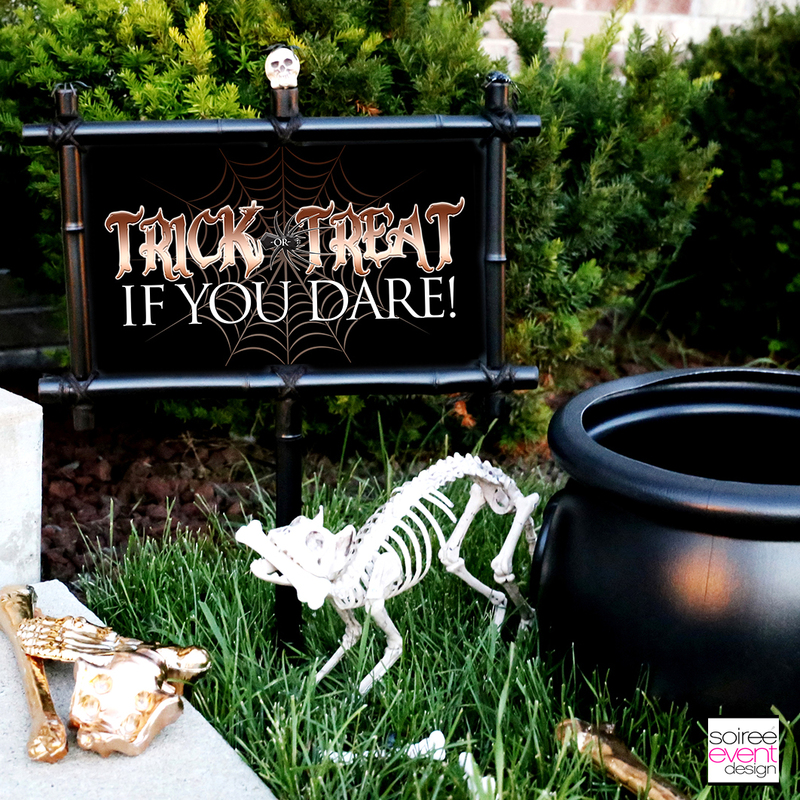 GIRLFRIEND TIP: How cute is this “Trick-or-Treat If You Dare” sign I made using my printable that you can download for FREE over on Oriental Trading’s Fun365. Be sure to grab yours for this year or next! I love the idea of a trick-or-treat porch! This looks amazing The sign is really cute and the gold skeleton is great too. i love the gold details! this is such a great set up for halloween – so spooky! The golden skeleton is am amazing. The Halloween porch idea is truly inspiring. omg- how cute is this?! 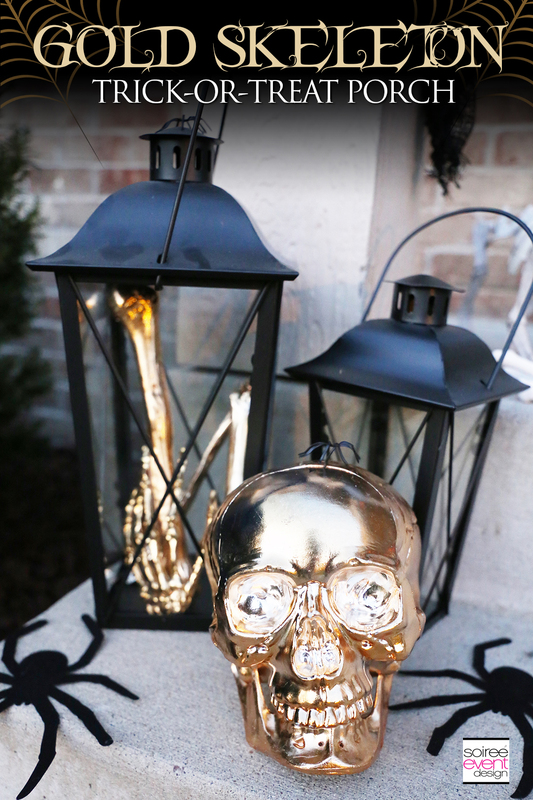 I love how it’s gold and your porch looks amazing… perfect for Halloween! Oh my goodness that is such an awesome set up! I absolutely love the gold skeleton as well what a neat idea. I love the front of your house! So fantastic. The skeleton dog is adorable and I never would have thought gold would work for a skeleton but it totally does. This is the coolest porch. As I said before, I LOVE your gold skeleton. I think I need to get one. We don’t get trick or treaters in my neighborhood. But I remember as a kid going to houses where they left out a basket of candy. It’s great when you can make it fun and just a little bit scary. Oh my, you are so creative!! What a great idea. I love ALL the decorations you shared – gruesome, scary and real-looking!!! I’m bookmarking this for next year. Thank you! I love it! Best porch ever! That gold skeleton is pretty neat! I like that color better then plain white. I’ve never thought of gold as a Halloween color per se. But after seeing this porch, am definitely reconsidering! I love to decorate for the Halloween. This looks amazing. I will have to to a few of these next year. My favorite part of Halloween is seeing all the porch and yard decorations. This is one of the most creative. It’s not every day that you see a gold skeleton just hanging out. This gold decor is so much fun! I love how it really brings all of the details out. I love Halloween decorating, and this is such a great design! I’ve not thought of going with gold for a skeleton but it really works! Wow how beautifully creepy is this Halloween porch set up! I love that it looks kinda classy and not just plain dirty and scary. I LOVE the gold skeleton! The whole look is amazing! The gold skeleton is such a fun way to spruce up an otherwise boring looking skeleton! Love what you’ve done with the porch as well! You are one of my favoite decorators. You even know how to make a Halloween porch look chic I love this! That is the neatest Halloween porch I have ever seen! I bet kids have LOVED seeing you for Halloween! I love the gold skeleton, its beautiful and a unique decoration. Your work is amazing. So much talent and super ideas always. I love the gold it looks so nice. I bet you had the nicest porch in all your neighborhood! It looks awesome and very chic for a Halloween decor! I really love the look of this! It’s not super scary and is also stylish and fun. Blinging up Halloween! My oldest is going to love this for next year! She loves decorating for every season! I love the idea of painting things that aren’t normally painted, especially gold! It’s never too late to enhance your Halloween haunted house to add a touch of fright to your party, or prepare for trick-or-treaters ! Thanks for sharing your ideas for outdoor decorations with skeletons 🙂 I’ve turned my own front porch into a bat cave with just a template, thick black paper, and painters’ tape. Your porch looks amazing! Always amazed with how homeowners put decorations together like this one and you put the elements of Halloween together so seamlessly! This is such a beautiful design, I love the details. I am not really into Halloween like that, but I do love your design. so creative and clever. Wow. Wish i had a porch to decorate like that. LOVE the c3PO skeleton…well, at least that’s what it looked like to me…lol. This is so beautiful! We just moved into a new home and were so excited to see that most of our neighbors had big festive Halloween displays. This would have been awesome on our porch! The gold skeleton looks so much more cooler than the white ones. All your decor and setup was awesome! You always have the best DIY tips! This will surely be a HIT! This is a fantastic idea. I really love how you designed your porch. I didn’t do Halloween this year let alone trick or treat but this porch is just amazing! I love the idea! This is seriously so cool and so festive! I’m definitely trying some of these ideas as inspirations for my halloween party next year.